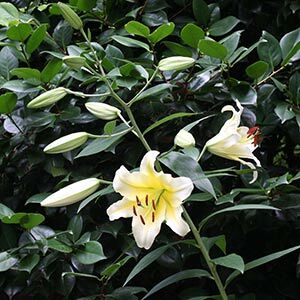 An outstanding hybrid, Lilium Conca d’ Or is a strong tall growing variety that will reach 2m in height. Large lemon flowers face outwards and appear sequentially over 3 – 4 days. As Lilium ’Conca d Or’ eventually reaches full bloom it dominates the garden for a number of weeks. Flowers are fragrant and very attractive. 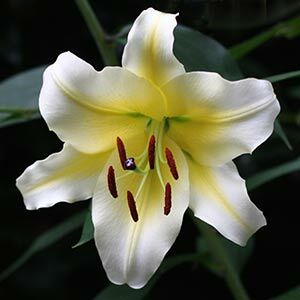 This hybrid has been inducted into the Lily Hall Of Fame of the North American Lily Society, and was the winner in 2010. Although all lilies require similar care, ’Conca d’ Or’ does need a little special care to perform at its best. Firstly it is tall growing with large flowers, this means it can get top heavy. In good conditions it will self support, however staking MAY be required. Best planted in a position where it does not have to reach for light. The upright growth habit is such a position usually means a stronger stem. Full sun is OK however dappled afternoon shade will help the flowers last longer during hot summers. A humus rich, fertile and well drained soil will also encourage good strong growth. Bulbs are best planted around 15 cm deep and at least 20cm apart. we tend to plant them by themselves, it goes them even more chance to show off. We plant ours beneath some evergreen Azaleas. The cilium grows up through the Azalea foliage and is supported by it. The flowers rise above into the sun and they do not need to reach for the sun. Fertilise with a general purpose fertiliser in early spring, and use some liquid seaweed fertiliser through the season. Lilium ‘Conca d Or’ can be propagated by division. Dig the bulbs every 3 -4 years, divide and replant.